Perfectly grinds coffee from coarse to very fine for better tasting coffee. Grinds coffee for all types of coffee and espresso makers. 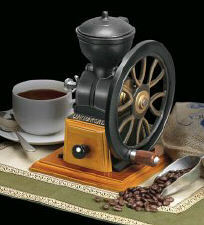 This gourmet coffee grinder also grinds nuts, spices, grains, and other beans. Cast Iron covered hopper with sloped chamber, precision grinding adjustment knob that allows you to grind from a coarse coffee to a flat bottom espresso grind. So glad I made this purchase. Works beautifully.